Joe and Noelene asking Toby to decide which of them he wants to live with. KERRY: Just stop it. I suggested that you let Toby have a *say*, not to choose instantly between the two people he loves most in the world. NOELENE (angrily): You had plenty of time to tell him. JOE: Oh yes – out of the blue with no warning. JOE: Oh yeah, that's right, typical, let *me* do all the dirty work. He runs out, looking upset. 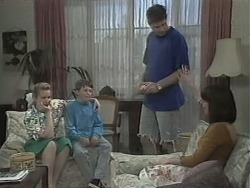 Kerry growls at Joe and Noelene that she doesn't believe what the two of them have just put that little boy through. JOE: Of course you do – it's only natural. TOBY: ...But when I was away in Darwin, I missed you and Kerry and Sky and Bouncer. I love *all* of you. JOE: Listen, Tobe: whatever you decide to do, it's OK by me. If you want to go with your mum, I'll understand, and there'll be no hassles from either of us. We just want you to be happy – not that it's going to be the same without you round here, mate; I mean, Kerry and me gonna miss you heaps... and granddad... Madge is just getting used to the idea of you calling her ‘grandma'! They'll understand – you know. If you decide to go away, they'll just think ‘he's doing it for the best'. Don't worry about it. It'll be all right. Toby sits there, still looking upset. PAUL: And to what do we owe this pleasure, then, Hilary? HILARY: Paul, I think you're going to be rather pleased with what I have to say. I've decided to return to Adelaide to live. PAUL: Is this because you lost the court case over your tax? PAUL: Look, Hilary, if there's anything I can do to help with the move, just don't hesitate to call, eh? HILARY (sharply): I'm sure Matthew and I can manage. HILARY: I expect you *will*, Helen. I'm not exactly leaving *today*, you know. PAUL: Anything to keep her happy, gran. As long as she keeps her money *in* the business and her nose *out* of it, hm? NOELENE: If it isn't the Iron Man himself! JOE: Bet it's got a flamin' spa, as well. KERRY (warns): Trying to score points isn't the way. You can't *bribe* Toby to stay. KERRY: Joe, what about the trip? And all the gear you've promised him? JOE (snaps): Oh, well, it's a stinking world, isn't it, when a father can't buy his son a few presents without everyone thinking it's a con. KERRY (tersely): All I am saying is you're not making it any easier for Toby to make up his mind. He may be a child, but he can sense what's going on between you and Noelene; he can sense it's a contest for the two of you. JOE: I am not going to let him go without a fight. KERRY (retorts): That's not going to help Toby. When he finally chooses who to live with, he's going to know that one of you – someone he loves dearly – is going to be hurt. JOE: I just want him to know how special he is. I should've spent time with him *before* – long—. Oh, what's the point, eh? How do you know how I feel? He's not *your* kid. I mean, *you* don't care whether he goes or stays, do you? With that, he storms out, leaving Kerry looking astonished. MATT: Mum, I don't want to come back with you to Adelaide. MATT: Of course I do. Of *course* I do. Look, I *love* you. I'll miss you, mum, but there are other people, you know? MATT: Yeah, like Lee. I mean, everything's changed for her since she got that job, and she doesn't want to leave it just to go to Adelaide. *I* don't want to leave *her*. HILARY: A teenage crush is hardly good enough reason to break up an entire family. You're obviously disappointed in me. I'm not what you considered a perfect mother should be. I imagine you'll be glad to get rid of me. MATT (sighs): Come on. Come on – that's stupid. HILARY: Thank you, Matthew. For a moment, I thought I'd lost you too. 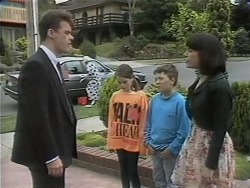 PAUL: You're prepared to go a few rounds for the Erinsborough News with me tomorrow? KERRY: Oh, so you've agreed to the interview? I didn't think you'd be game. PAUL: Kerry, if you looked a little bit further than your own backyard, you just might see that there's plenty of people out there prepared to support a project that's both progressive and provides jobs. KERRY: If *anyone's* out of touch, it's *you*. These days, there are environmentally- aware communities. 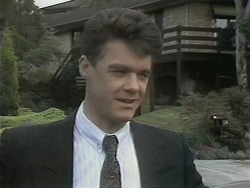 Erinsborough's one of them. No one's going to allow you to bulldoze a park. They'll see that for exactly what it is: an act of vandalism – and you're the vandal. PAUL: I'm not even going to *try* and convince you. I'm wasting my time. I'll leave that up to the decision- makers. LOCHY: You bully. You're always picking on little kids. Paul just glares at her and warns her to stay away from his new car with her ball. HILARY: Yes, he *has*, as a matter of fact – which brings *me* to the question: have you thought any more about accommodation? LEE: Yes. Well, Matt and I are getting a place together, somewhere around Erinsborough. HILARY (frowns): I think you're mistaken – Matthew's coming with *me*. LEE: No, but he doesn't *want* to. That's what he said. HILARY: I think you've misunderstood his intentions, Lee – he's definitely leaving. Now, I've given great consideration for what's best for Matthew, and once he's back in Adelaide – away from certain influences... – he may like to resume his studies. And of course, his foster parents are there, and all his friends. LEE: Look, I understand why *you* want to leave Erinsborough: all that mess with your tax and your break- up with Mr. Muir; well, I feel sorry for you. HILARY (snaps): I don't need your sympathy, young woman. LEE (ignoring Hilary's outburst): That's not your son's fault, so why should *he* have to pay? Hilary, all his plans are for *here*. The only reason he'd decide to go with you is because you'd make him feel guilty if he didn't. HILARY (coolly): I assure you, Miss, that there's more to Matthew's decision than *that*. After all, blood is thicker than water. Hilary sits there stony- faced. NOELENE: Listen, I know that you and Kerry have done a fantastic job with him; but you know, Joe, I reckon I need him as much as he needs me. JOE (nods): Yeah. Yeah, yeah. Look, I know you're a good mum, Noels. *I* was the nuthead, wasn't I. Didn't even – didn't even get to *know* my son; but then I got him again; I got a second chance. He's great; he's just the best. I love him. NOELENE (murmurs): Yeah. We both do. So for his sake, whoever he wants to live with, we've got to cop it sweet. No more blues. Promise? JOE: Look, don't you care about anything except your causes? There is something going on here, you know? It's *important*, as if you hadn't noticed. With that, he walks out, leaving Kerry to murmur that she's sorry. PAUL: I know *exactly* who would've done it, gran. LEE: Hilary says you're still going with *her*. If you don't want to get a place with me, I wish you'd just say so. MATT: Of *course* I want to get a place with you. I told mum that I wanted to stay here and she got really upset, and while I was trying to comfort her, she misunderstood; thought I'd changed my mind. LEE: Fine. Where does that leave *us*? MATT: Lee, we're going to be together, OK? You've got to trust me on that. But you also have to let me find the right time to tell her, OK? Lee sits there looking relieved. KERRY: You've got no proof it was *either* of them. PAUL (snaps): Oh of *course* it was kids. I mean, look at the way the word was spelt for a start. Besides, it was you that was calling me a vandal while these two [he indicates Lochy and Toby] were listening in, wasn't it? KERRY: What happened to that white- shoe cleaner you were using before? LOCHY: It wasn't him, it was *me*. Paul mutters that he should have known, and he warns Lochy that her parents are going to be hearing from him. Helen chips in quickly that there's no real harm done and she suggests to Paul they go for that drive – *now*. TOBY: I've made my decision. JOE: Good. What's it to be, then? TOBY: Well... I don't want to leave anyone – but... I'm going to live with mum. TOBY: It's not that I don't love you; I *do* – you're my *dad*. TOBY: But... well, you've got Kerry... Sky... Bouncer... a whole family. Mum's got nobody except *me*. TOBY: You mad at me? JOE (shaking his head tearfully): I'm so proud of you, Toby. This is one of the hardest things you're ever going to have to do, you know? And you've handled it better than any of us. TOBY: I'll always love you, dad. Always. JOE: You better. You're my best mate. Joe pulls Toby into his arms and hugs him tightly, both of them crying. LOCHY: Ryan says they've got crocodiles in Darwin that *eat* people. TOBY (smiles): I don't think they come into town! JOE: I'm going to miss you. Toby repeats the words back to him, sadly. Joe then gives him a kiss and watches as he climbs into the back of the cab with his mother. The driver starts the engine and the cab heads off down the street. Toby peers out through the back window as Kerry and Joe watch him go, sadly.